SIOUX CENTER – Diapers. Sleepers. Blankets. Wipes. Baby shampoo. afford the necessities for their newborn babies. Many families take buying these items for their newborn babies for granted, but some families struggle to afford these necessities. A group of Sioux Center Middle School sixth-graders took it upon themselves to give these families a great head start by packing Baby Bundles full of necessary items. They donated a dozen bags to Promise Community Health Center in Sioux Center to provide to moms who have a special need for them after the birth of their baby. families who need the items. Each of the six sixth-grade Prime Time groups at Sioux Center Middle School applied for and were awarded $250 grants from Project Jack, which is funded by the Realtor Foundation of Iowa. The project – which is in memory of Jack Lindaman, who died in 2010 when he was 6 years old from spinal muscular atrophy – offers middle school students the opportunity to “pay it forward” by doing various projects to help others. Sixth-grade teacher Kelsey Gibbons said the students in her group wanted to do a project to help kids in their own community. They threw out ideas and voted on them. Ultimately, they decided to assemble bags full of baby supplies and to donate them to Promise Community Health Center to distribute to families of newborn babies who need them. Promise, which serves many families and children who are at or below the poverty level, also had a Baby Bundles program in place that relies on community donations. The students used their own ambition and initiative to take the grant project one step farther, however. 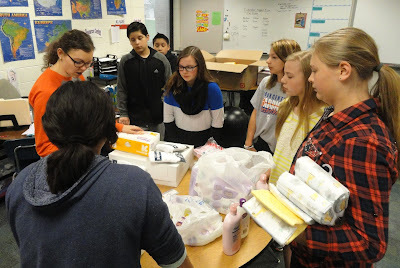 Instead of just using the money to buy baby supplies, the students used the funds to buy Sioux Center Warrior lanyards and bumper stickers to sell at the middle school and high school as a fundraiser. Health Center for families that need the items. In doing so, they turned $250 into nearly $400. That allowed them to purchase supplies to fill 12 bags with an impressive array of items. They also donated leftover money to Promise’s Baby Bundles program for future use. Gibbons said the students embraced the project. She hopes the students developed additional empathy through the project. cards to put into the Baby Bundles. Sixth-grader Ella Jahn said the project will help the community. Classmate Peytan Toering had similar sentiments. The students also created cards for the families to put in the bags. 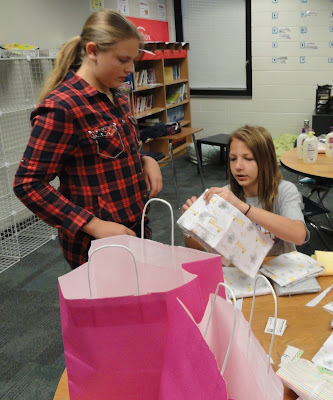 In addition to Promise Community Health Center, other organizations that were supported by the Sioux Center Middle School sixth-grade Project Jack projects included: Atlas, The Bridge, Hope Food Pantry, One Body One Hope and Sanford Children’s Hospital. Sioux Center Middle School also received school supplies for students who move into the district during the middle of the year and can’t afford the items. SIOUX CENTER – Rebecca Mangold knew she wanted to go into a career where she could help people. During college, she thought that might be as a missionary. But plans changed. She discovered that she could help many underserved people as a mental health therapist right here in northwest Iowa. health integration with primary care services. Mangold, a provisionally licensed mental health counselor for Creative Living Center in Rock Valley, now is seeing patients one day per week at Promise Community Health Center in Sioux Center. Promise has a contract with Creative Living Center for Mangold to provide the service 8 a.m.-5 p.m. Wednesdays. 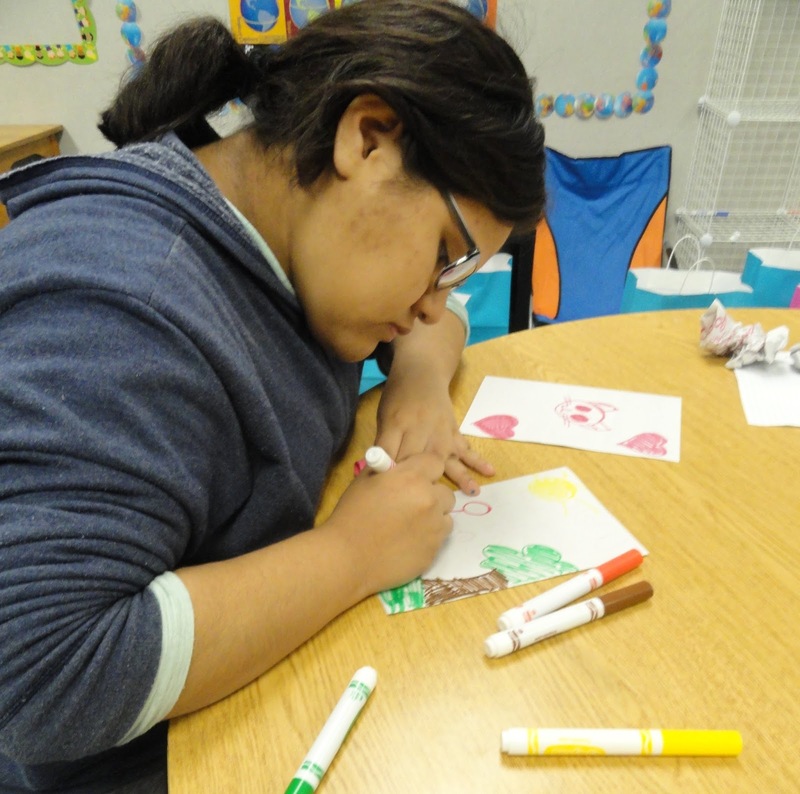 “Through conversations, they realized that this could be a good partnership since I’m starting out as a therapist, and I also speak Spanish,” Mangold said, referring to Promise’s large Spanish-speaking population. Mangold, a 2008 graduate of Albert Lea High School in Minnesota, earned degrees in psychology and Spanish at Northwestern College in Orange City in 2012. After taking a year off from school after college and serving for a few months as part of the Lutheran Volunteer Corps at a law agency in Oakland, CA, she enrolled at the University of South Dakota and earned her master’s degree in clinical mental health counseling in December 2015. She started working at Creative Living Center in January and began seeing patients as a therapist for Promise’s behavioral health program on April 13. A: To me, I think of behavioral health or mental health, those two terms, as taking care of yourself in another way because we all have minds and we all have emotions and feelings. Sometimes those are really difficult, too. There are a lot of life situations that happen that are not easy to experience or go through. It’s hard to know how to cope with it. Sometimes it’s helpful to talk to an outsider. You can spend a lot of time with family and friends and keep saying similar things to them, but that fresh pair of ears can be helpful in and of itself. They’re a little more removed from the situation. Q: What are the most rewarding aspects of this profession? A: Being allowed to enter into somebody’s most sacred and intimate part of their life. You know, that’s a lot of trust to share with someone things that they maybe haven’t shared with someone else. I feel really honored and humbled by that – when people are able to open up and be vulnerable with me. Q: Why are behavioral health services so important, and why is it good to integrate them with primary care? A: What I’m excited about being at Promise is being able to provide therapy in Spanish as well. Interpreters are awesome. They do great work, but it changes the dynamic of therapy. I’m really glad I can bring a bridge for that language gap. Hopefully, that will make that therapy space as comfortable as it can be without having too many outside people. A: I’m just blown away. The impression I get is Promise is trying to think about all avenues of health and trying to get as many people on board to provide those services. When I personally hear health center, I usually just think medical. So it’s really amazing to me that, no, they have medical; they have dental; they have vision; they have behavioral health. That comprehensive model is just amazing to me. Promise Community Health Center, headquartered in Sioux Center, is the only Federally Qualified Health Center in the far northwest corner of Iowa. Promise provides medical, prenatal, dental, vision and behavioral health services. To learn more, visit www.promisechc.org. Rebecca Mangold and her husband, Dan, live in Orange City. She enjoys music, particularly playing violin, and outdoors activities, including going for walks and fishing. Promise Community Health Center also has a contract with Seasons Center for Behavioral Health for providing behavioral health services. Maggie Greving, a therapist for Seasons, has been seeing patients 8 a.m.-noon Mondays and Thursdays at Promise. Pedro Ruiz serves as Promise’s full-time behavioral health care coordinator and interpreter. SIOUX CENTER – As Mother’s Day approaches, Promise Community Health Center will celebrate mothers and the legacy they leave their families. 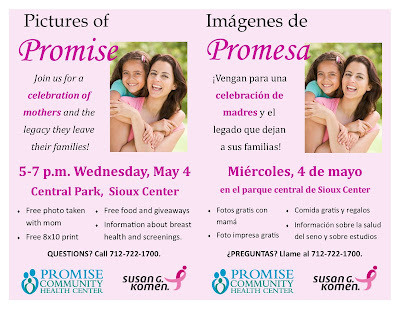 The health center is planning a Pictures of Promise event for 5-7 p.m. Wednesday, May 4, at Central Park in Sioux Center. As a centerpiece of the event, each mom who attends will have a free portrait photograph taken with her family. Each family then will receive a free 8-by-10 print of the photo in a frame. The print will be available for pickup at Promise on Thursday, May 12. Tomales, chips and salsa, and cupcakes from Olivia’s Bakery in Sioux Center will be served. Women who attend will be provided with education materials about breast health and breast cancer prevention and screenings. 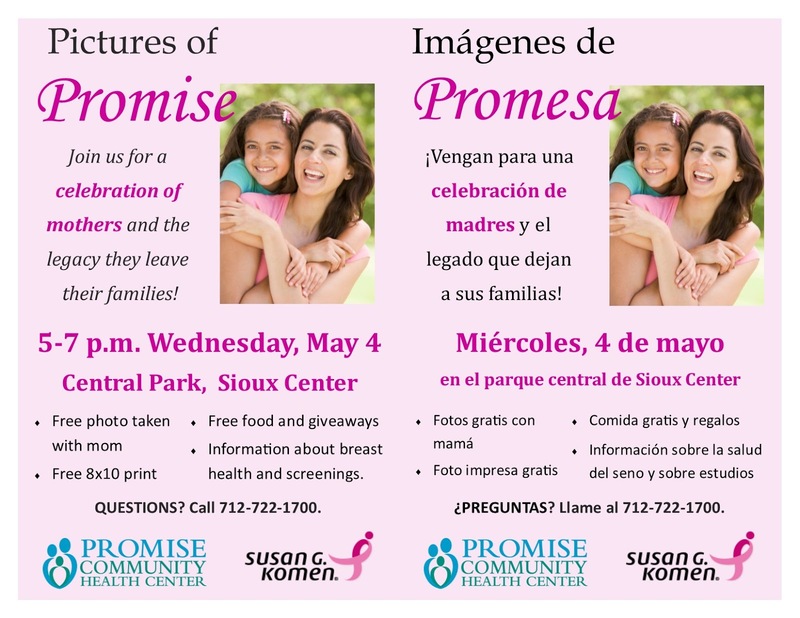 The event serves as a community outreach opportunity through Promise’s Sister to Sister/Hermana a Hermana project, which is funded by a grant from the Susan G. Komen for a Cure Siouxland Affiliate. Promise held the Pictures of Promise event previously in 2013. All moms and their families are invited to attend to attend the community event. Reservations are not required to attend Pictures of Promise. It will be in an open-house format, so people can come and go as they please. For more information, contact Kleinwolterink at 712-722-1700 Ext. 170 or kendrak@promisechc.org. return every year for the annual bicycle ride. SIOUX CENTER, IOWA – Bicyclists might want to give riding on gravel a try. Or, they can have their choice of three paved routes, ranging from 6 to 60 miles, that received raved reviews last year. A 30-mile gravel surface ride is being added as a new fourth route for the sixth annual Wellness on Wheels Bicycle Ride. WOW6 is slated for Saturday, June 4, as an official event of Sioux Center Summer Celebration and the community’s 125th anniversary celebration. The event, which is put on by Promise Community Health Center of Sioux Center with the help of many great business sponsors, also includes a meal, great prizes and a complimentary event T-shirt. including a new 30-mile gravel surface route. June 4, with four routes planned for riders. A nearly 60-mile paved route will travel through scenic southwestern Sioux County through the communities of Hawarden and Ireton. Aid stations will be located in those towns to welcome riders and rejuvenate them with Gatorade, water and snacks before heading back out on the road. The ride will depart at 7 a.m.
A nearly 30-mile paved route will travel through rural Sioux County to Ireton, where one of the welcome stations will be located, before returning to Sioux Center. The ride will depart at 8 a.m. The new 30-mile gravel route will take riders on a large loop through rural Sioux County past some interesting features and will intersect with the Ireton welcome station. The ride will depart at 8 a.m.
A 6-mile Fun Ride will travel to Sandy Hollow Recreation Area and back on the Sioux Center Recreation Trail. A welcome station with refreshments will be located in an open shelter house halfway along the way to provide riders a place to stop on both the route there and back. The ride will depart at 9 a.m.
Nate Nykamp, an avid bicyclist and WOW committee member who spearheaded the design of the routes, thinks the new gravel surface ride will appeal to a growing segment of the cycling population. He hopes people give it a try. ride during the 2015 WOW event. Nykamp said the WOW’s longer paved routes were kept the same as last year mainly because of the positive reviews from riders. The 60-mile route features “some of the most beautiful and quiet roads that Sioux County has to offer,” including riding along the Big Sioux River and the rolling hills of western Sioux County. 30-mile gravel route is planned for this year. If 30 or 60 miles is too much for the leisure bicyclist, they might want to ride the 6-mile Fun Ride that travels the countryside on the Sioux Center Recreation Trail to Sandy Hollow Recreation Area, a park managed by the Sioux County Conservation Board. The route also is perfect for families with small children. If they can't make it all the way to the park, they will be able to turn around at the welcome station that will be provided halfway. A meal featuring Casey's breakfast pizza will be served to all the riders when they return to Children's Park from their morning treks. Drawings for great prizes – boys and girls youth bicycles and two bicycle computers – will be conducted. A complimentary T-shirt also will be given to riders. Participants who register by the early-bird deadline of May 19 will be guaranteed a T-shirt in their size. WOW not only is a fun, relaxing, outdoor activity that promotes wellness, but it also serves as an annual fundraiser for Promise. The health center provides medical, prenatal, dental, vision and behavioral health care to patients – with a particular focus on serving underserved people and helping them overcome barriers that they face to health care. The cost of the 30- and 60-mile rides is $25 per rider for those who register by the early-bird deadline of Monday, May 23. The cost will increase to $30 after that date. The cost for the 6-mile Fun Ride will be $10 per rider through May 19 and $15 after that date. Bicyclists can register online for the Wellness on Wheels (WOW6) at www.allsportcentral.com. Or, they can fill out and return a paper registration form. Forms are available at Promise Community Health Center, 338 First Ave. NW, Sioux Center, Iowa, and at various locations in the community. A form also can be accessed online on Promise's homepage at www.promisechc.org or by clicking this link. Call Promise Community Health Center at 712-722-1700. Promise Community Health Center will put on WOW6 with the help of these generous sponsors: American State Bank, Sioux Center Health, Northwest Bank, Peoples Bank, Primebank, Dordt College, First State Bank, Hull Pharmacy, Iowa State Bank, Isakson Chiropractic Health, Lewis Family Drug, Mane Attraction, Proactive Physical Therapy & Sports Rehab, Robin's School of Dance & Fitness, Sioux Center Chiropractic Wellness Clinic and Vander Kooi Freight. The following businesses are donating prizes, materials or services to the event: Brothers Bike Shop, Casey's General Store, Fareway, Hy-Vee, Iowa Information, McDonald's and Walmart. Read this feature story on Bert Van Batavia, a 72-year-old farmer who will be riding in the WOW6 Bicycle Ride. SIOUX CENTER – Every middle school and high school athlete must get a sports physical every year to compete in school sports. physicals will be offered in an open-house format. Promise Community Health Center in Sioux Center is providing parents with a convenient way to get that done for their children. 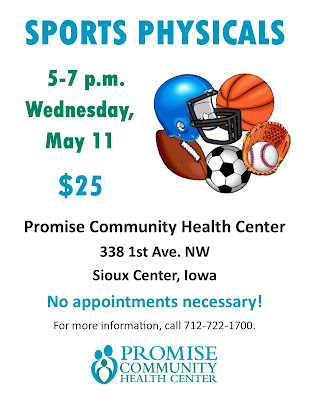 Promise’s staff of providers will be available to offer sports physicals in an open house format 5-7 p.m. Wednesday, May 11. The athletic physicals will be provided at Promise’s location at 338 First Ave. NW, across the street from the Sioux Center city offices. The cost will be $25. No appointments are necessary. 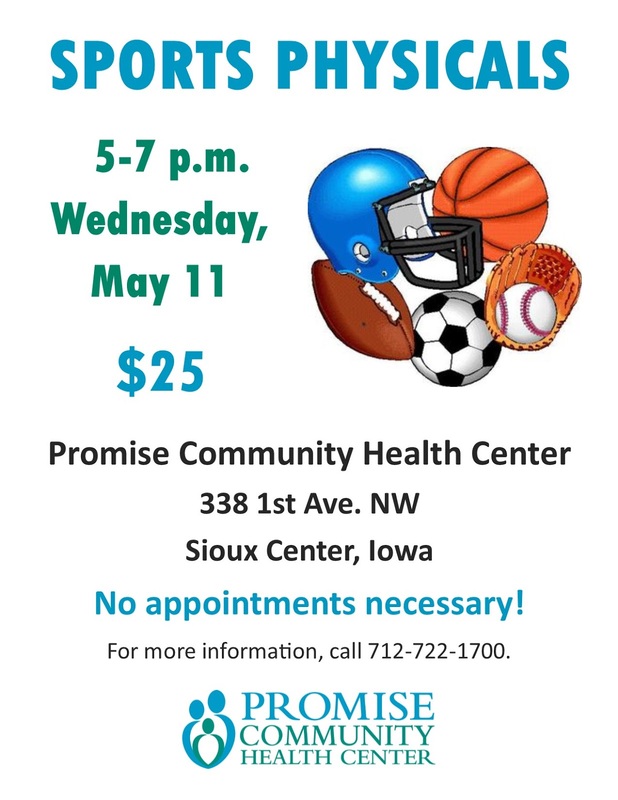 Promise decided to offer this opportunity for students after hearing feedback from many parents and other people in the community regarding athletic physicals not being offered at school this year in the Sioux Center School District and a few neighboring schools – as they have in the past. Therefore, Promise will fill the need of students in the convenient format. Tana Kass, one of Promise’s nurse practitioners who will be providing the sports physicals, thinks it will be the perfect solution for busy moms such as herself. “I’m a mom of five boys, and when it comes to sports physicals, it can be a nightmare to get it all done,” Kass said. Promise also will be prepared to provide updated immunizations to students who need them. As it has for the past six years, Promise also will offer low-cost sports physicals as part of its Back-to-School Block Party during National Health Center Week. This year’s event will be Wednesday, Aug. 10. Free dental screens and vaccinations also will be provided, along with free food and block party activities. 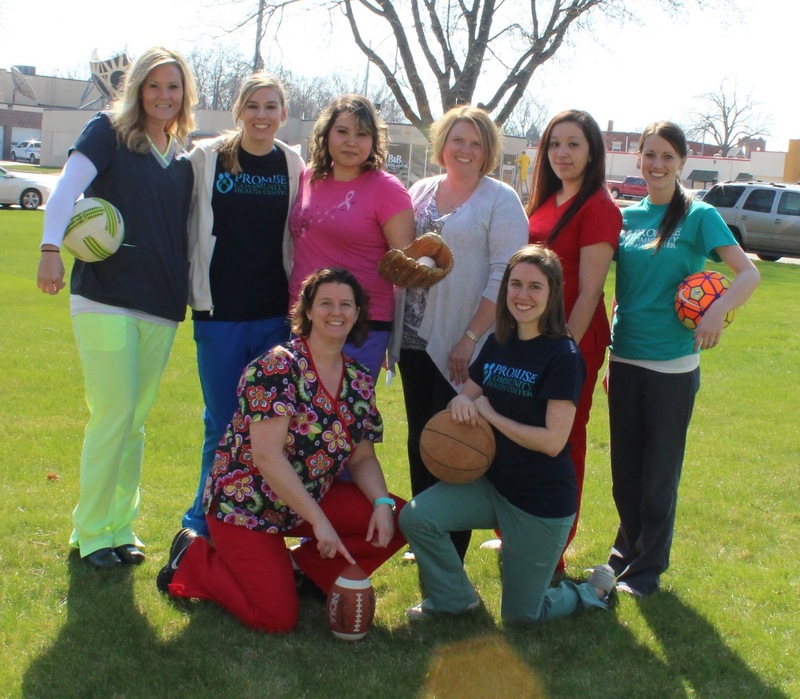 For more information about the sports physicals, call Promise at 712-722-1700. According to Iowa law, all student-athletes must provide their school with a completed athletic preparticipation physical examination form each year. It must be filled out and signed by a licensed provider, such as the providers at Promise Community Health Center in Sioux Center. The sports physical certificate is good for one year, plus an additional 30-day grace period.